When two actors negotiate a price, there is often a range of deals the parties find mutually acceptable. The bargaining problem is figuring out which price they will ultimately settle on. This course covers the technical aspects of bargaining theory and explain how parties can sway negotiations in their favor. 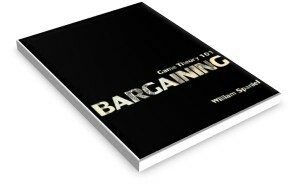 For more applications on bargaining, consider picking up a copy of Game Theory 101: Bargaining.